One of the terrific movie marvels of that fabled golden year of 1939, Howard Hawks’ Only Angels Have Wings spins its engrossing tale of flyers in the Andes with such surety and fervor that it only grows in stature with each passing year. Plot: At a remote South American trading port, the manager of an air freight company is forced to risk his pilots' lives in order to win an important contract. One of the terrific movie marvels of that fabled golden year of 1939, Howard Hawks’ Only Angels Have Wings spins its engrossing tale of flyers in the Andes with such surety and fervor that it only grows in stature with each passing year. A wonderful array of actors do some of the best ensemble work of their lives in telling these stories of courage and foolhardiness that only men dedicated to a task and to each other can spin taking us along with them on the scary and unforgettable adventures they all share. Running a ramshackle mail service out of the port village of Barranca, Peru, Geoff Carter (Cary Grant) makes tough demands on himself and all of the other pilots often expecting them to brave hazardous weather, swooping condors, and the perilous natural terrain in order to fulfill their commitments, a rich payday and full-time contract awaiting the company once a certain number of deliveries have been successfully accomplished. Several new arrivals throw some conflict into Geoff’s tidy little kingdom: showgirl Bonnie Lee (Jean Arthur) disembarks from a cruise ship, sees Geoff Carter, and is instantly smitten even though the risky job and the flyers’ cavalier attitudes toward death make it nearly impossible for her to accept Geoff on his take ‘em-or-leave ‘em terms. Aviator Bat MacPherson (Richard Barthelmess) is looking for work but has a shady past of bailing on a fellow pilot who happens to have been the younger brother of Geoff’s best friend and fellow pilot Kid Dabb (Thomas Mitchell). And Bat’s young wife Judy (Rita Hayworth) is the girl Geoff left the States to escape after a nasty breakup. But mishaps and accidents cripple Geoff’s crew so that he has to take on Bat as a pilot even though the other men (Allyn Joslyn, Sig Ruman, Victor Kilian, John Carroll) are none too eager to work alongside him. Longtime Hawks regular Jules Furthman wrote the script from stories of Howard Hawks’ adventures in aviation during and after World War I. In typical Hawksian style, the men are bonded for life (interesting when halfway through the movie John Carroll’s Gent Shelton is fired for refusing to carry a load of nitroglycerin during bad weather, he still sticks around for the remainder of the movie: these are men he loves and wouldn’t be happy anywhere else), and the occasional woman is interesting for a dalliance but not for anything serious enough to take their focus away from their jobs and their male family. The Oscar-nominated special effects may seem like fairly obvious miniatures mixed with live action shooting (featuring some spectacular stunt flying and death-defying dives toward Earth), but Hawks only uses them to cap takeoffs and landings oftentimes relying on radio byplay between home base and the lookout Tex (played by the very young Don “Red” Barry) to keep his audience riveted to every moment of peril. Sentiment is held in check until a life lost really has an emotional impact (an early casualty is brushed aside to show us the men’s stoic attitudes toward mortality, but the death of a major character late in the movie carries an enormous amount of poignancy). Cary Grant is less about being dapper and witty here instead playing the hard-bitten commanding leader of the company who doesn’t let his affection for his men cloud his judgment about their readiness to fly. Despite a dryer and darker series of acting choices, he’s as appealing as ever. Jean Arthur eventually slides into the mode of a Hawksian woman (“just one of the guys”) though her girlishness and too-easy emotions (counter to Hawks’ wishes as he reveals in one of the Criterion disc’s extras) often get in the way of the film’s tone and the director’s intentions. Thomas Mitchell may have won his Academy Award in 1939 for Stagecoach, but it’s hard not to imagine that his work in Gone With the Wind and as the lovable Kid in this film, especially in a climactic scene with Cary Grant, didn’t also help his chances to walk away with the supporting actor trophy that year. The movie offers a rich, chastened kind of role for one-time silent heartthrob Richard Barthelmess who’s excellent as the regretful Bat MacPherson. As his unhappy wife Judy, Rita Hayworth has her first chance in an A-film and does a fine job of it, holding her own with the seasoned pros who surround her. Sig Rumann offers early enjoyment as the hotel/pub/store owner Dutchy though he tends to fade into the background later in the movie. Noah Beery Jr., Don “Red” Barry, John Carroll, Allyn Joslyn, and Victor Kilian all contribute wonderfully to the great camaraderie of the male supporting cast. The PCM 1.0 sound mix (1.1 Mbps) has been cleaned completely of any age-related problems with hiss or crackle, and the result is a joyous listening experience. The dialogue is always easy to understand, and while the source music (a jazz rendition of “One of These Days,” some brief snatches of “The Peanut Vendor Song,” a vocal and guitar solo by Maciste) has very good fidelity, the main music on the track is intentionally the atmospheric drones of the airplanes and the various sputters, plunges, and mishaps that occur during the running of the movie. Howard Hawks Interview (19:31): an audio-only interview with the master director conducted by Peter Bogdanovich in which he discusses his war experiences and interests in aviation and his opinions on the quality of Only Angels Have Wings. David Thomson Interview (17:04, HD): the critic offers a most interesting video analysis of the movie. Howard Hawks and His Aviation Movies (20:22, HD) film historian Craig Barron and Oscar-winner Ben Burtt discuss the aviation movies of Howard Hawks (The Dawn Patrol, Ceiling Zero, along with Angels) and then offer information on the various types of planes used in the movie, show fascinating outtakes of some of the special effects miniature sequences, and discuss the effective use of plane sounds as a substitute for a background score. Lux Radio Theatre (56:37): the 1939 broadcast of the radio adaptation of the movie starring many of the actors from the film including Cary Grant, Jean Arthur, Thomas Mitchell, and Richard Barthelmess. Enclosed Pamphlet: contains cast and crew lists, information on the audio and video transfer, and critic Michael Sragow’s analysis of the movie. 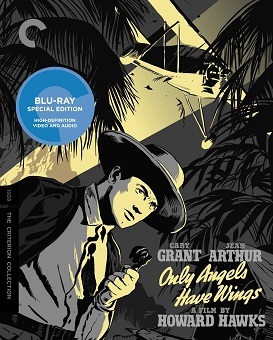 A terrific film with a first-rate cast, solid direction, and an involving story that holds one’s interest until the end, Only Angels Have Wings is once again available in high definition now on Criterion. It is a must-see for lovers of classic cinema and comes heartily recommended. Great film of a great yr. @ the movies ! Does anyone know how this one compares to the first bluray of this title that was released by TCM? I have that one and wonder if it's as good. as it came out. It's a keeper. Fantastic review Matt! I got the disc the other week and was blown away by it. Somehow I had never seen the movie before, and it was just a riveting, fantastic, wonderful piece of moviemaking. And then the transfer was equally mindblowing – it looked brand new. If you like this movie, it's a must have, and if you're a fan of Howard Hawks or Cary Grant or Jean Arthur, or just classic Hollywood in general, I'd absolutely recommend a blind buy. It was a day one for me. One of my favorite movies. I wish there was a commentary track. That was the reason I didn't give it 5/5 for bonuses. This classic needed a great commentary track to identify those fantastic actors with their long, distinguished careers and Hawks' magnificent direction that made a 2 hour movie seem like 90 minutes. The great Rudy Behlmer could've knocked this one out of the park if given the chance, I think. Bleh, Behlmer is the cure for insomnia around these parts. What do you think I use commentary tracks for? It's win-win! Kidding aside — if you sleep near a blu-ray set up, pop in a commentary and lie back and listen. It's a great use of that drift off time.